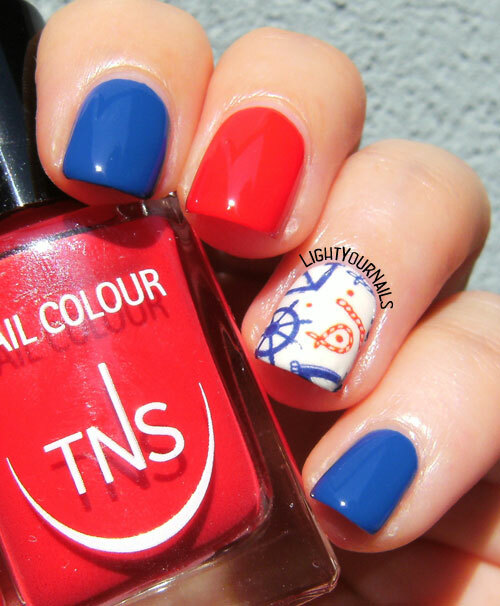 Easy nautical manicure | Light Your Nails! Oggi vi propongo una semplice nail art a tema nautico creata con smalti TNS Cosmetics e dei trasferelli di Nicole Diary. 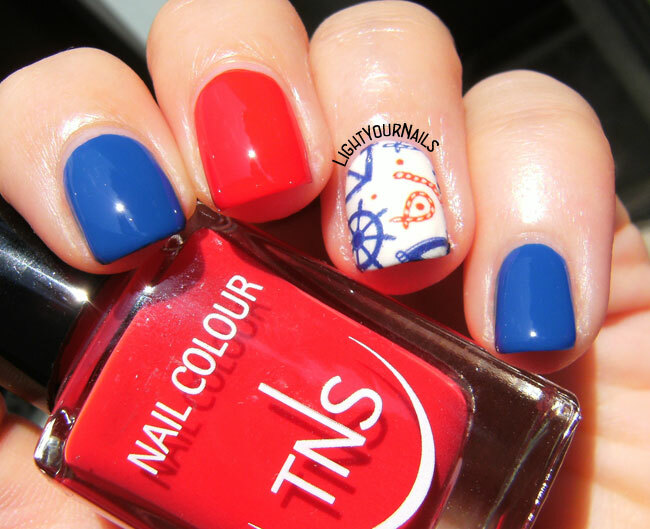 Today I am gonna share with you an easy nautical themed manicure I created with some TNS Cosmetics nail polishes and water decals by Nicole Diary. Non sto a parlarvi degli smalti che ho usato, ma ho linkato sopra le loro review in caso ve le siate perse. Spendiamo invece due parole sui “trasferelli” dello store Nicole Diary. Prima di tutto chi è Nicole Diary? E’ una ditta cinese che vende prodotti per nail art su Aliexpress e Amazon. Un po’ alla BornPrettyStore per capirci (che sicuramente tutti conoscete). I prodotti di punta di questo brand sono i water decals, che sono questi trasferelli che ho usato oggi, e i dischetti per stamping. Per quanto riguarda i water decals la scelta è davvero ampia e vi posso dire che la mia esperienza è stata ottima. Ho sempre problemi a far aderire questo tipo di prodotto sulla curvatura delle unghie, quando si tratta di quelli a disegno intero. Invece con questo non ho avuto alcun tipo di problema e come potete ben vedere ha perfettamente aderito all’unghia. Dopo aver messo l’adesivo a bagno per qualche secondo e averlo fatto staccare dalla base si ha tempo per posizionarlo sull’unghia nel punto preferito. Inoltre l’adesivo è lunghissimo quindi va bene anche per chi ha unghie lunghe o lunghissime. Per quanto riguarda la larghezza invece non sono convinta che possa andar bene per tutti. Io non ho unghie nè strette nè larghe, ho usato l’adesivo pensato per l’anulare e non c’era tanto bordo rimasto da pulire, quindi non so se possa bastare a chi invece ha unghie più larghe. I am not gonna bore you with details of the nail polishes I used, they are all linked above though. Let’s focus on Nicole Diary’s water decals instead. First of all who’s Nicole Diary? It’s a Chinese brand selling nail art items on Aliexpress and Amazon. Similar to BornPrettyStore if you know what I mean. 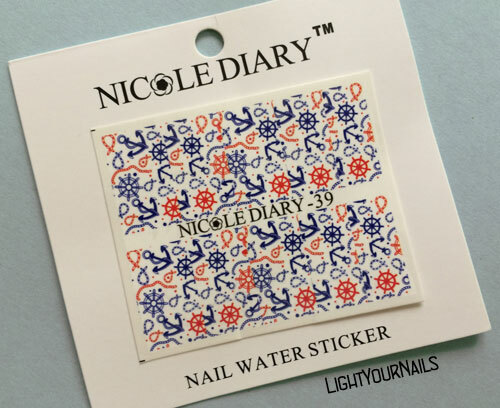 The main products by Nicole Diary are water decals and stamping plates. Regarding water decals they sell a huge variety of them and my experience with this set was really good. I always have the biggest problems smoothing full nails water decals onto my curved nails. This time it was super easy and the decals adhered perfectly, you can see that in the macro shot. After leaving the decal in a water bowl for a few seconds I let it slip off its base and I had enough time to play until I found the desidered placement for it. The decal is very long so it fits any nail length. However I am not sure it fits larger nails! I used the decal meant for the ring finger and there was no big stuff to clean at the sides, and I have no thin or large nails. Adoro questo set a tema nautico, come adoro qualsiasi cosa a tema marino in effetti. Ho scelto di usare solo le strisce per anulare e pollice per questa nail art, e mi sono tenuta le altre per una futura. Ovviamente nulla vieta di usare il set per una manicure completa! Vi piace questa nail art o è troppo semplice per i vostri gusti? E conoscevate già lo store Nicole Diary? 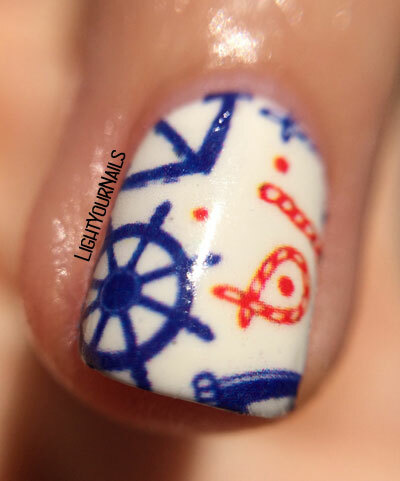 I love this nautical themed water decals set, but then again I love anything that has to do with the sea! I decided to only do my mani with the ring and thumb decals and keep the rest for a future nail art. You can use the set for a full mani obviously! How do you like this nail art? Is it too simple for you? And have you ever heard of Nicole Diary? I recently heard of ND randomly and I have some stamping plates of them in my shopping basket, waiting for me to get permission from myself to purchase them ;) I love this mani, I think the decals are evem better as an accent nail than as a whole manicure, it really makes it stand out! Especially the way you skittlette-d this with the blue nail, is perfection. I stumbled upon ND while browsing Aliexpress for new stamping plates! Non sono certo una fan delle manicure a tema nautico ma questa mi piace davvero moltissimo, brava, ottima scelta di colori e abbinamenti! I love this mani! I actually thought it was stamping as well lol! That's my favourite red creme in my stash! Such a cute mani!! Perfect colors to go with that decal! Ohhh I love that decal design! I think I'm going to have to add it to my next order! I havent heard of Nicole Diary, since today! ☺ I like the colours that you've picked they look great! I've only discovered them recently while browsing for new stamping plates on Aliexpress! Bright reds and blue always make me happy! So cute. Love that these water decals will work on nails with curve. That's always my biggest issue with decals! Mine, too! These gave me no issues at all! I thought the decal was stamping as well, it looks so good! You paired it well with the red!